Tutorials // Why does my printer under-extrude? When the printer isn’t able to extrude the requested amount of plastic, it means it is under-extruding. When it happens, the print will have some holes, missing layers or thin layers. The infill can also have these holes or lack of material, the layers aren’t well bonded together. After a while, the pressure in the head will increase and the feeder will do a skip back, this is a wanted an normal behavior, it prevents the filament from being grinded and also prevents damaging the feeder motor. This skip back can be seen if you look at the feeder, you will also hear a “tack” sound coming from it. Under-extrusion can happen because of many things, we will detail each of them. 3D printing can be long, sometimes very long, we are often tempted to increase the print speed to have it finish sooner. Increasing the speed to much is one of the most frequent causes of under-extrusion. 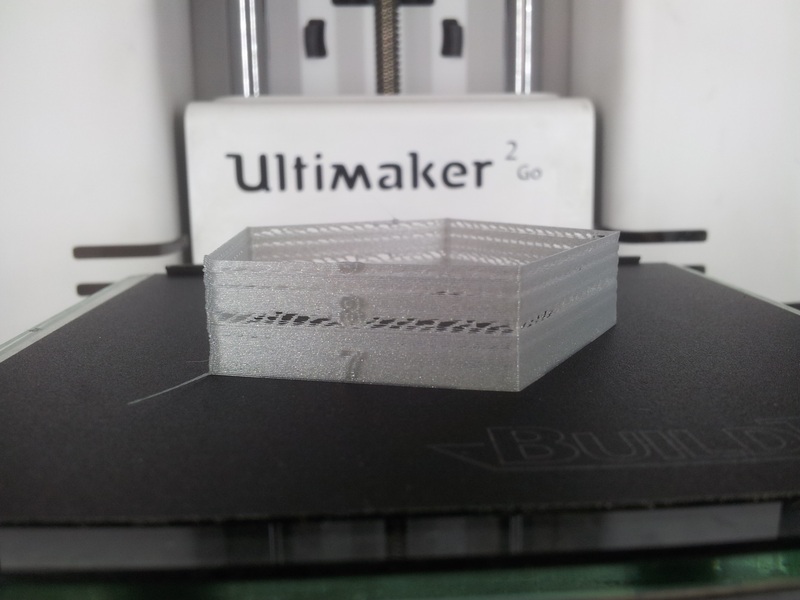 We consider that an Ultimaker 2 can reach 7mm3/s, it is possible to go higher with well tuned printers. To calculate this rate of flow you have to multiply the size of the nozzle (standard size is 0.40mm) by the layer height and the speed. So if you are asking to print 0.2mm layers at 50mm/s the rate of flow is: 0.4 x 0.2 x 50 = 4mm3/s. These settings should work with no issues on an Ultimaker 2 in a good working state. You will also notice that higher speeds are also resulting in worse quality, so learn to be patient and wait a couple of hours more! In general, for good quality print at speed between 20mm/s and 50mm/s. 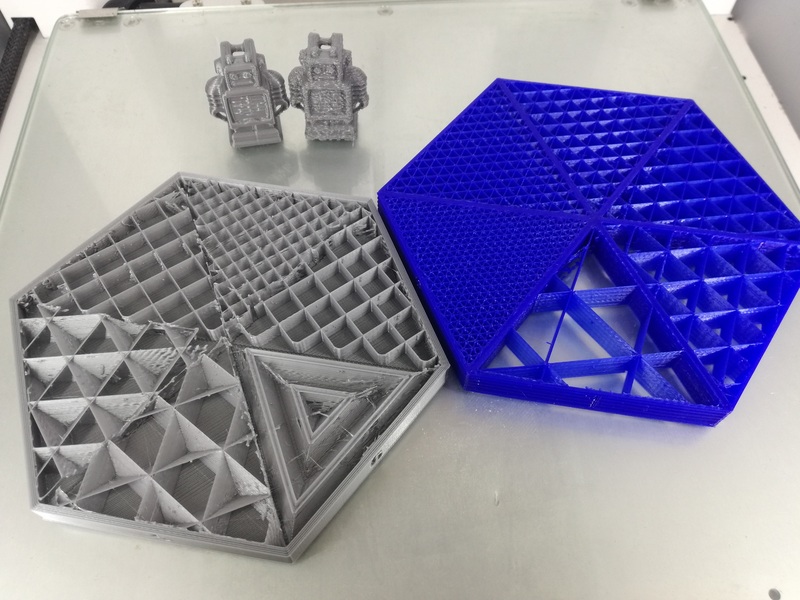 If you want to print an object where quality isn’t an issue (rapid prototyping), you can increase the speed to 80mm/s or more but pay attention! 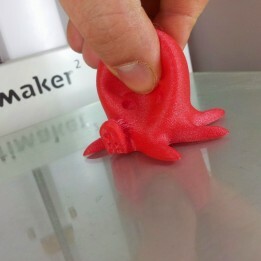 The printing temperature is a very important factor in 3D printing. It varies in function of types of filaments, colors, and also requested rate of flow. The rate of flow is strongly affected by the temperature of extrusion. It is possible to reduce the temperature a lot if you print slowly with small layers. For example, if you print 0.06mm layers at 30mm/s (rate of flow=0.4 x 0.06 x 30 = 0.72mm3/s) you can reduce the temperature as low as 190°c for PLA (depending on the brand and color of the filament). If the rate of flow increases, the filament has less time to be melted, to compensate this the temperature must be increased. For PLA, the maximum limit is considered to be around 240°c, this temperature can be used for rate of flow of 10mm3/s and more, if you have to increase the temperature over 240°c for a normal rate of flow, then there is a problem! If the filament is grinded in the feeder, it means that you must increase its tension. 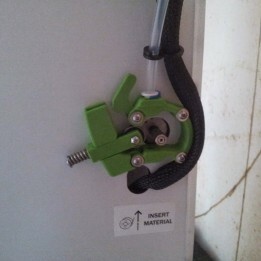 To increase the tension in the original feeder, you must use an hexa key and inserted it in the top right hole of the feeder. There is a difference in the type of springs for the Ultimaker 2, if it was delivered before march 2014, the white indicator must be on the top. If it was delivered after march 2014, the white indicator must be in the middle. When the tension in the feeder is correct, and that the filament can’t be transported as it should (for whatever reason), the feeder will make a skip back, preventing the filament to be grinded. If the filament is grinded, the feeder will loose it’s grip on the filament, it will not be able to push it anymore and at that moment under-extrusion will appear. 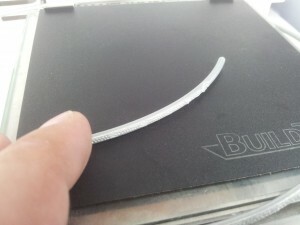 It can also happen that the grinded filament area gets stuck in the bowden because it’s too wide and flattened. When the filament is grinded, you must take it out of the bowden and cut everything after the grinded area. When the spool is almost empty, the filament has a tighter curvature, this will add some extra friction in the bowden tube. Generally when you reach the end of the spool, it’s advised to reduce the printing speed to avoid having under-extrusion. It’s also possible to take the filament from the spool and try to reduce the tight curvature by hand. Sometimes the filament gets tangled on the spool, it can happen if you don’t pay attention when you take your filament out, or, less frequently, during the creation of the spool at the factory. 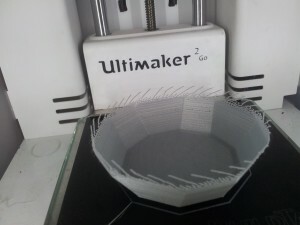 After a while, the filament will have more and more trouble unrolling from the spool, the feeder will have trouble to stand up to the rate of flow requested and under-extrusion will appear. This is not easy to spot, but if you store your filaments correctly, it shouldn’t happen! When you change your filament, make sure the end of it doesn’t go under some of the filament on the spool, you can either put it in a hole in the spool (if the spool has some), or print some useful clips to maintain it in place. It is possible that the nozzle of your printer can begin to be clogged, for example you printed ABS and then you changed to PLA. The lower temperature of PLA can cause some residues of ABS to stay in the nozzle and too clog it partially (or entirely). This will prevent the filament from reaching the exit of the nozzle at the wanted rate of flow, and lead to under-extrusion. To solve this problem, read this tutorial! 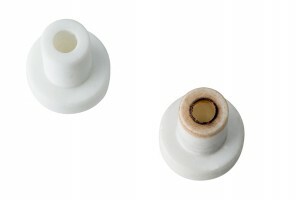 Before reaching the nozzle, the filament must passe through the Teflon insulator. 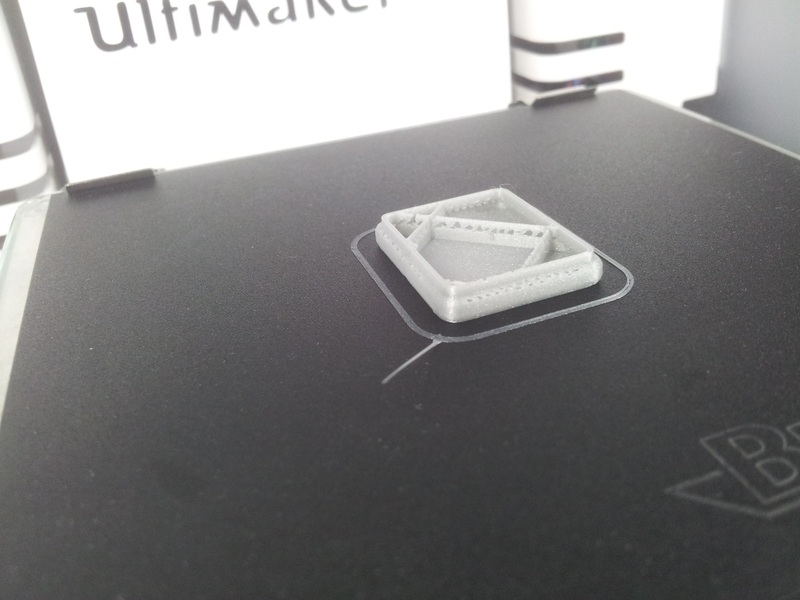 After a while this part can deform, because of the materials printed and the temperatures used. To check it, you must dismantle the head part, you can then try to put a piece of filament through it. If you feel some kind of friction, it is most probably time to change it. If you are in an emergency and need to print, you can drill it out at 3.2mm, but you will still need to change it. 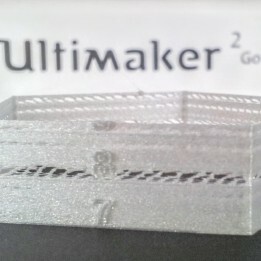 Ultimakers works exclusively with 2.85mm filaments. This size is very important, and must be respected. Until 3mm it’s considered to be acceptable, but over that size, under-extrusion will increase. A wider filament will have more friction in the bowden tube and in the Teflon insulator. A quality filament, with a constant diameter is always a good investment. Less problems, less failed prints, it’s worth the extra cost! In the feeder there’s a wheel that pushes the filament in the bowden. This wheel is fixed on the motor axle. It is possible that the screw that maintains this wheel in place gets loose. The feeder wheel will slip on the axle and the filament will no longer be transported as requested. Less material will be brought in the head leading to under-extrusion. 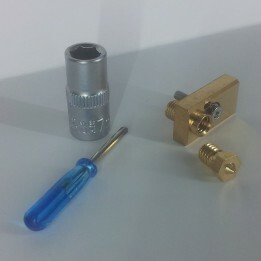 This screw can be tightened with an hexe key. The feeder must be opened to do so. When your printer is under-extruding, what you must not do is increasing the flow. Imagine that the nozzle of your printer is a hall way filled with people. It get’s smaller and ends with one exit door. If the amount of people inside is important, and that they already have a hard time getting out, imagine what will happen if you increase the number of people inside the hall way! Under-extrusion is not a normal behaviour, it must be resolved at the root cause. If only you manage to print PLA at 240°c at 20mm/s for 60 microns layers but that it doesn’t work anymore if you change one of these 3 parameters then there is a problem that must be resolved! First step is to find the cause, then apply the solution. 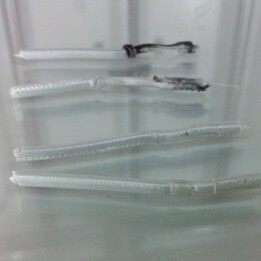 Start with the easiest causes to test: speed, temperature, feeder tension, problems with filaments. If these are not the causes, then clean the nozzle with some cold pulls as explained in this tutorial. If you still experience some under-extrusion then dismantle the head and check the Teflon insulator. 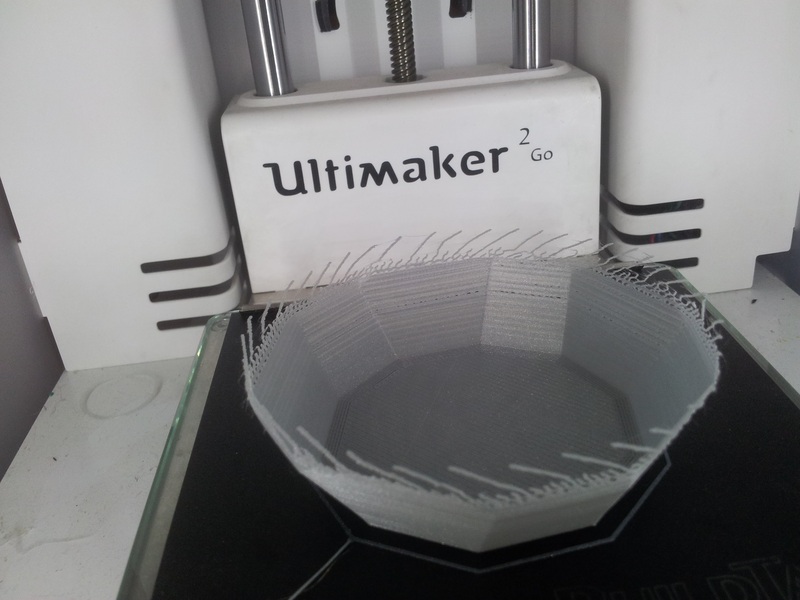 If you still have some trouble then come and ask the Ultimaker Community!